If you could reach more than half of our audience with a single tool, you’d be crazy not to use it, right? Which makes me wonder why college media staffs aren’t bear hugging Instagram for being an amazing content promotion tool. More than 50 percent of adults 18-29 reported in 2014 that they used the photo sharing app, according to the Pew Research Center. You’d be silly not to promote your content on an app that 53 percent of your audience likely uses. Perhaps it is the 60 million pieces of content shared daily around the globe that has you concerned. How will you stand out in that mass? 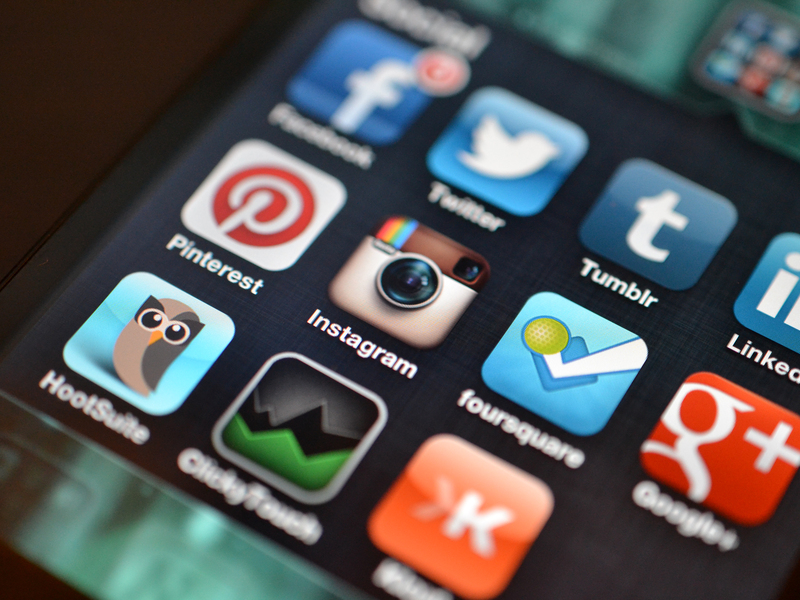 How will you gain attention from a worthwhile number of the app’s 300 million users? I get it. That’s a lot of pressure, especially when there are some weeks when you don’t even have enough photos for the newspaper. The staff I advise is just embracing Instagram, having decided early on that they wanted to focus on Facebook and Twitter and not add other social mediums until they could “do it right.” I can’t argue with that logic. We also can’t argue that the time has come to add Instagram to your social media mix, if you haven’t already. Here are my 11 tips for using Instagram to promote student media content. Your social media accounts should have a tone that reflects your staff, and represents your audience and school. You want the tone and voice to be united across all of your social accounts. Instagram is not an exception. One thing we discussed just today in editorial board meeting is that students do not come to Instagram to see negative or stressful news. They want to see happy, cute, fun, or inspiring visuals (read: puppies and babies) in their Instagram feeds. We plan to focus on that type of content. The staff I advise is in this stage. 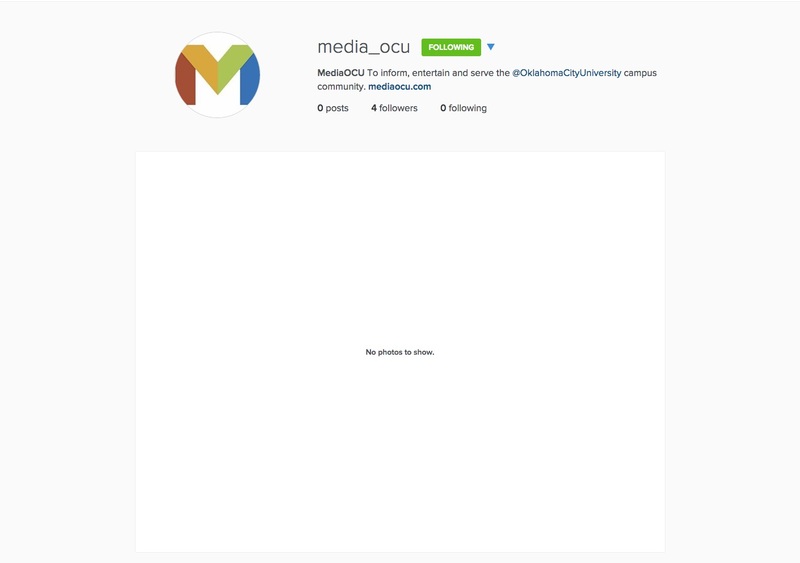 They want to have a handful of photos and/or videos posted before they really start publicizing the account because they don’t want students to go there and find it bare. You don’t need a ton of content to get started, but a row of three to five photos would be nice. My staff’s new account is a bit sad right now, but it hasn’t officially launched yet. The four followers are myself and a couple of editors. Hashtags are a key way to build your audience. Adding general hashtags to the end of your captions will get your photos more exposure. You don’t want to go hashtag crazy, and you never want to have more hashtags than caption content, but you should include some. An interesting thing about Instagram hashtags is that viewers seem to be less annoyed by them than they might be on say Twitter. You are turned away by too many Twitter or Facebook hashtags, but Instagram posts with 11 hashtags get the majority (almost 80 percent) of the engagement. I still think 11 is way too many hashtags, but this research shows that people really use Instagram hashtags as a subject-oriented way to find content. By the way, Instagram allows for up to 30 hashtags per post! Here are the top Instagram hashtags, but don’t feel married to them. One great thing about Instagram is that they show you how popular the hashtag you type and related ones are, allowing you to adjust. Also, don’t forget to add hashtags unique to your school or content. For example, your staff’s name, your school hashtag, etc. Oh, and don’t forget to take advantage of trending hashtags by relating them back to campus. For example, #NationalDessertDay is trending right now. I’ll bet there’s a sweet treat on or near campus that students eat often. Post a picture of the dessert, use the hashtag and ask students to respond with their favorite dessert. Peg Fitzpatrick is the queen of hashtags, calls to action and engagement. Here is an example from a regular feature she runs. I recommend you follow her account as a great example. Instagram is one of those social mediums that you can overdo. People don’t want you flooding their feeds with your photos. Most brands post once or twice a day on Instagram. Once a day is a good place to start. Add a second post if something really big happens, but do your best to spread the posts out. If you want to post multiple photos from the same event, consider whether Instagram is the right medium. Remember that you can always post a single photo and send viewers to your website to view more photos of the event. If you simply must post more than one photo from the same event, consider making a collage. Also, don’t forget to watermark your photos with your logo. This helps with branding and assists in avoiding content theft. following/visiting the accounts of people who visit yours and liking some of their content to show appreciation. 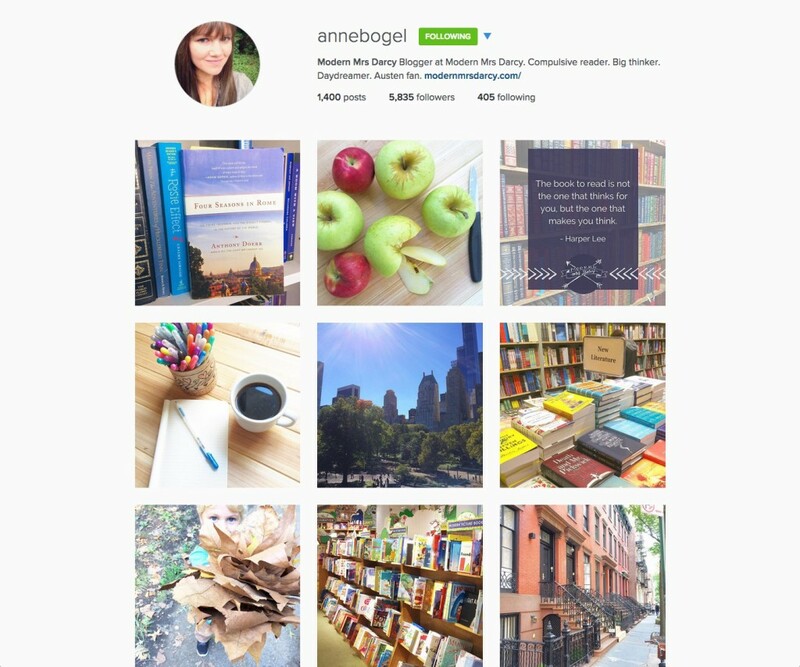 Your Instagram account also is a good place to show your audience your editorial process. 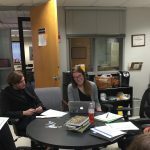 Don’t forget photos from staff meetings, retreats, conferences, or just the editors “working hard on this week’s edition of your student newspaper.” Instagram is a great tool to help put faces and names to your staff and help build reader relationships with them. I love this Instagram photo of some of my editors during last year’s distribution event. Instagram is a photo sharing medium, but that’s not all it does. You also should share short video clips and other visuals like quotes on Instagram. 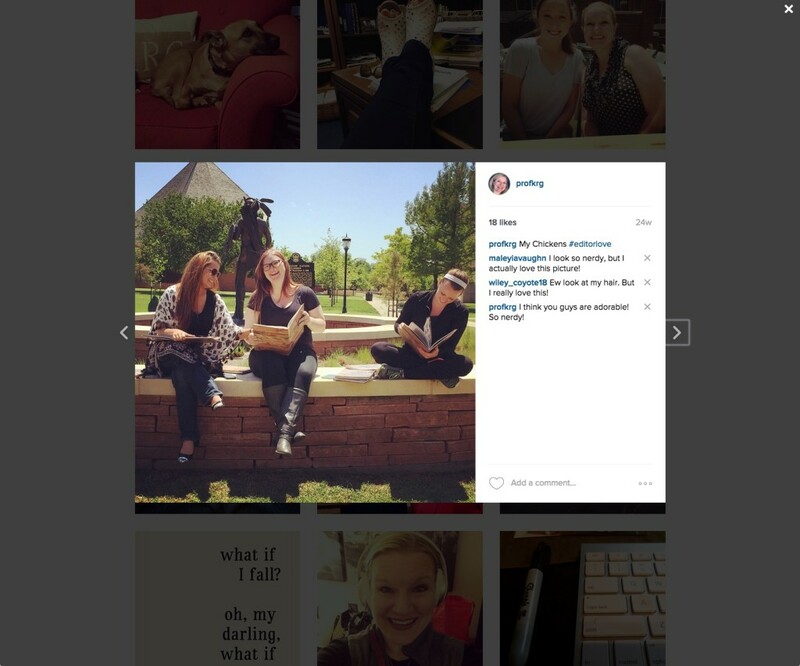 Think of the possibilities available for student media staffs in sharing quotes on Instagram to promote stories. 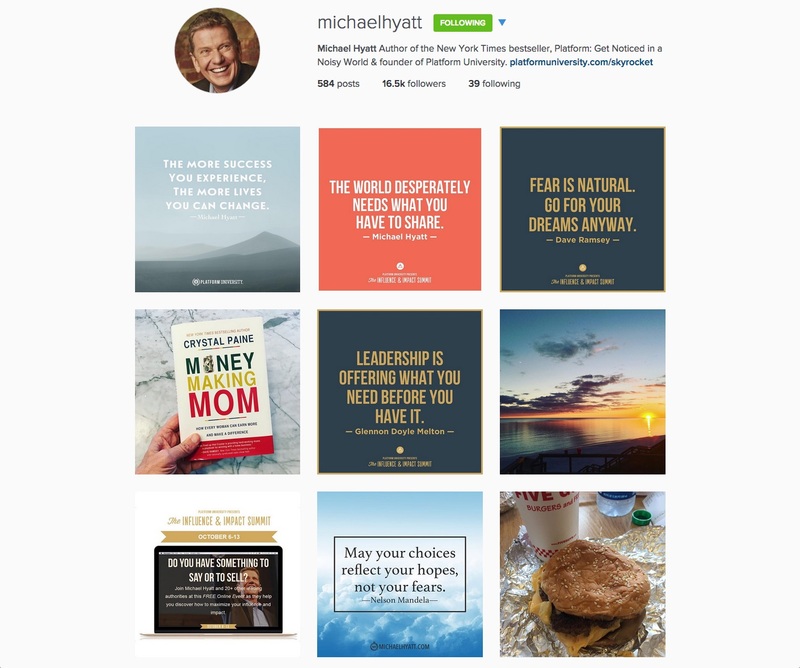 Michael Hyatt, another one of my favorite bloggers, has started posting quotes on his Instagram account. I love them! Notice that they all include his branding at the bottom. Also, Michael had a random hamburger, which is kinda fun. Don’t forget to use Instagram to remind readers to “pick up this week’s issue,” to participate in providing news tips or to enter in contests. You also can use your account to promote campus events, activities or groups. For example, maybe you post a throwback photo to last year’s homecoming while reminding your viewers that homecoming is this weekend. Include a call to action on every photo that it makes sense to do so. This is simply using your Instagram account to drive traffic to your website and better serve your readers with additional content. Your Instagram account is one of your social properties. Don’t forget to use it to promote your other social media accounts and vice versa. I know this isn’t a comprehensive list of all of the fabulous ways you can promote your student media staff and content with Instagram, but it is a good place to start. Many staffs, including mine, still have a lot to learn about the app’s possibilities. I would love for you to share your best practices so far. Include your Instagram account name and some of your best tips/practices in the comments below. The biggest problem with instagram is that you can’t use the desktop app to post photos. They all have to go through a mobile app. profkrg Also curious about what your “distribution event” looks like… Did it help with circulation, engagement with the hard copy, etc.? profkrg Thanks for the shout, Kenna! PegFitzpatrick You bet, Martini. Thanks for being an amazing example and putting out great content.